Bloxia is the first Blockchain Accelerator that combines Human & Artificial Intelligence in a community driven One-Stop-Ecosystem. Bloxia is here to unlock the world of Blockchain & Crypto for mass adoption. Blockchain can be considered as the most fundamental technological revolution of the last decades and can influence our daily life in many ways. Unfortunately, this new world is currently full of barriers: Most people have no simple access, no unbiased advice, massive security/privacy concerns, steep learning curve involved in order use blockchain-based services. In short: Blockchain is currently the internet without a web browser. Blockchain technology has a great potential but without mass adoption the benefits of Blockchain & DLT won’t take effect, most token-based services will fail, we won’t see a sustainable day-to-day integration, the volatility of cryptocurrencies will remain and current crypto-investors will face huge losses. Enters Bloxia. Bloxia is here to solve all the problems which hinder the growth of Blockchain technology. Bloxia breaks down all barriers that have locked-out the crowds and creates a unique community with millions of users. Just imagine that everyone with a smartphone can own Cryptocurrencies with a few clicks. Get advised by a unique combination of Artificial + Human Intelligence. Store digital assets in the world’s first mobile hardware wallet. Purchase and exchange cryptocurrencies as easy as never before. Participate in token-based services with a single click. Not afraid of regulations because of legal compliance and much more. This would open the world of Blockchain & Cryptocurrencies to millions of new users and billions of fresh capital. This would accelerate the digital revolution. This is Bloxia. Meet the most secure Smart-wallet with its unique SafeKey security vault and Ice-wallet, the world’s first hardware wallet for smartphones. From now on your private keys are locked in a pocket size Fort Knox and you can manage them hassle-free whenever you want. B|SAFE will handle 50 Coins/Tokens right from start and add more on behalf of the Bloxia Community. The built-in exchange function will allow users to manage all their assets in one place without leaving Bloxia. B|SAFE integrates seamlessly with the whole Bloxia ecosystem. Receive rewards, store your digital identity or add data from Blockchain services. B|SMART comes with the BLIX - the most sophisticated cryptocurrency market data powered by AI. For the first time Bloxia merges data from market, business and media to creates AI-Predictions backed by an expert community. Good bye “Pump & Dump Groups”. B|SMART will revolutionise crypto investing by combining artificial and human intelligence for better investment decisions. Buying coins/tokens becomes as easy as buying shoes: Just a few clicks within B|SMART and everyone can invest. Either purchase single coins/tokens or AI-based Smartfolios and easily stored them in B|SAFE, convenient payed with BLOX or FIAT. Regulations require KYC procedures for most token-based services. We help users to keep in full control of their data: They get a unique BloxiaID which becomes their decentralised virtual identity where only the users decide which data is shared with whom. 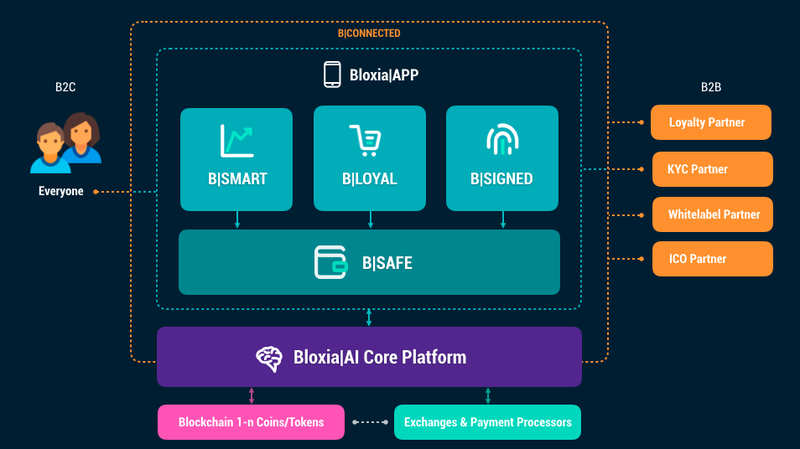 In future, the BloxiaID is the only needed KYC-process to unlock other token-based services with just a single click in our marketplace and extending the Bloxia app with useful applets. When buying at hundreds of the top online-shops and brands, Bloxia users get rewarded with BLOX that are directly credited in their wallet. Bloxia enables a new kind of mining for everyone and B|LOYAL turns B|SAFE into the first self-filling wallet. With every purchase, the value of the BLOX token will rise. Bloxia users will experience a real day-to-day integration and the customer awareness for Blockchain-solutions will rise.